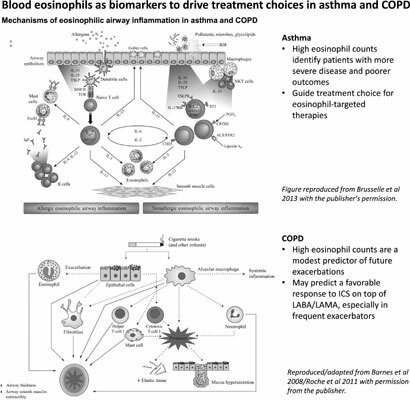 Keywords: Blood eosinophils, asthma, COPD, biomarkers, airway inflammation, treatment options. Keywords:Blood eosinophils, asthma, COPD, biomarkers, airway inflammation, treatment options. Abstract:Background: Asthma and COPD are complex, heterogeneous conditions comprising a wide range of phenotypes, some of which are refractory to currently available treatments. Elucidation of these phenotypes and identification of biomarkers with which to recognize them and guide appropriate treatment remain a priority.